Mineral springs of Leukerbad have been well known since Roman times. Leukerbad is home to the largest thermal spa and the highest Alpine Spa and Wellness centres in the Alps. There are 30 wonderful spas in the village, mostly associated with hotels. Leukerbad hot thermal springs attract tourists all year round. The village is among the top 5 tourist destinations in Valais region with around 1 million overnight stays per year. Every day nearly 4 million litres of thermal water flow from 65 thermal springs into 30 thermal baths. Leukerbad can offer you active and at the same time relaxing holidays! Leukerbad is located in the Valais canton of Switzerland. Although Leukerbad became famous long time ago thanks to its thermal spas, winter sports haven't been around so long. Ski lifts are presented here for more than 50 years. The skiing area of Leukerbad has fantastic views of the Matterhorn and Mont Blanc. It has grown world famous for hosting several world cup races. There are different accommodation options in Leukerbad. You can choose from over 20 hotels and self-catering apartments. There is a good selection of restaurants, bars, boutiques, spas and a cinema in the village. Besides skiing or snowboarding, Leukerbad has a variety of activities to offer: it has facilities for ice-skating, curling, tennis and squash, cross-country skiing, winter walking, snow-shoeing, Leukerbad Rehabilitation Centre. And of course, Leukerbad offers an incredibly wide range of choice with many different spa treatments for pampering, fitness and health. Closest train station to Leukerbad is Leuk, which is only 14km and 25 minutes drive and has a short bus transfer to Leukerbad. Switzerland is well known for its efficient rail network, but we still recommend you to order direct airport transfer to get to your chosen destination. That is the most convenient and time-saving option. We carefully calculate all resort transfer services individually, to be sure that our customers never overpay. Whenever you choose to travel and whatever your final destination, Alps 2 Alps will get you there for the best possible price. However, we advise booking early to access the best possible deal. In addition, keep up to date with Alps 2 Alps for the latest offers, deals and discounts on Leukerbad resort transfer services. All of the above will only ever result in our base-rate for ski transfers going down – we never over-inflate our prices at any time or for any reason. We also offer substantial discounts for off-peak, off-season and midweek transfers to Leukerbad. If looking for the best possible deals, travelling outside peak season or midweek typically results in the biggest savings. We offer midweek (Monday to Friday) prices with up to 60% discount than weekend prices. Your transfer quote will also depend on vehicle availability, transfer schedule, vehicle utilisation and other costs like road tolls and airport parking charges. In all instances, we work hard to keep our prices low and are relentlessly committed to total value for money. Which is why we guarantee you won’t find a better deal on your Leukerbad resort transfers, whatever your needs. The resort of Leukerbad lies at an elevation of 1,400m, with a max vertical of 1,440m and its highest lift going as far as 2,850m. 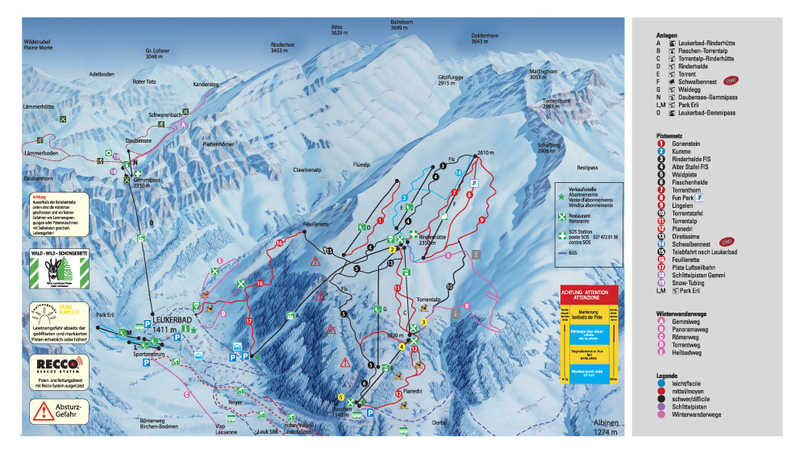 There are a total of 18 pistes in the immediate vicinity of the resort, served by 11 ski lifts and gondolas. Around 7% of the slopes are ideal for beginners, 57% serve the needs of intermediates and the remaining 36% is far more challenging. There are plenty of off-piste and tree skiing opportunities around Leukerbad's ski area. The ski resort has three different access points to the main slopes, a cable car and a gondola at separate departure points. Also, there are two drag lifts by the village, you can take the cable car across the valley up to the bigger ski area above with 50 km of slopes of all levels of difficulty, including World Cup training runs. Leukerbad has everything that you need for a perfect family holiday: a magnificent natural landscape where you and your family can practice different kinds of sport, family-friendly offers and varied leisure activities. Leukerbad's Park Erli which is situated on the edge of the town is an excellent learning area for children. The way we see it, Leukerbad resort transfers are about so much more than getting you to your final destination. After all, you also want to arrive comfortable, refreshed and ideally on time. Not all resort transfer services can promise this – Alps2Alps guarantees a higher-level service for every passenger. Keep your eyes peeled for the kinds of deals, discounts and special offers that could make your trip even more affordable. If looking to secure your seats for the best possible price, booking as early as possible is advisable.